Affiliated with the Biochemistry, Cellular and Molecular Biology Graduate Program, the Cellular and Molecular Medicine Graduate Program and the XDBio Cross-disciplinary Graduate Program in Biomedical Sciences. Juhyun received his Ph.D. from Pohang University of Science and Technology (POSTECH) in Korea. He was awarded a National Research Foundation of Korea Postdoctoral Fellowship when he joined the lab in 2011. Juhyun is interested in the functional organization of cortical projection neurons and in the cellular and circuit changes underlying the neurodegeneration of these neurons in amyotrophic lateral sclerosis. Kihwan received his Ph.D. from Seoul National University. He joined the lab in the fall of 2014. Kihwan has had a long-standing interest in neurodegenerative diseases and is currently working with mouse models of Amyotrophic Lateral Sclerosis. Seung-Chan received his Ph.D. from Brown University and completed his graduate work with Barry Connors. He then moved to lab of Denis Paré at Rutgers before joining the Brown Lab. Su-Jeong joined the lab in the spring of 2018. Kenji is interested in the cellular mechanisms underlying neurodegeneration in Amyotrophic Lateral Sclerosis (ALS, also known as Lou Gehrig’s disease) and Frontotemporal Dementia (FTD). She is jointly appointed in the Brown lab as well as the lab of Loyal Goff. Maxime is in the BCMB graduate program. Maxime graduated from the University of California - Berkeley. He joined the lab in the fall of 2015. Regjinae is an undergraduate student majoring in Neuroscience at Johns Hopkins. She joined the lab in the spring of 2018. Aaron is an undergraduate student in Neuroscience at Johns Hopkins. Jon is an undergraduate student at Johns Hopkins who joined the Brown and Goff Labs in 2017. He has been focusing on the molecular changes induced by mutations in the C9orf72 gene in the neurodegenerative disease, amyotrophic lateral sclerosis. Nidhi is an undergraduate student in Neuroscience at Johns Hopkins who joined the lab in 2016. Hyun-wook is an undergraduate student in Neuroscience at Johns Hopkins. Oluwa is an undergraduate student in Neuroscience at Johns Hopkins. She joined the Brown Lab in 2017. Courtney is an undergraduate majoring in Neuroscience. She joined the lab in the summer of 2018. 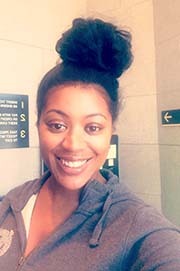 Chanel Matney, 2012-2017, Graduate student, Solomon H. Snyder Department of Neuroscience, Johns Hopkins University. Now at the Potomac Institute for Policy Studies.